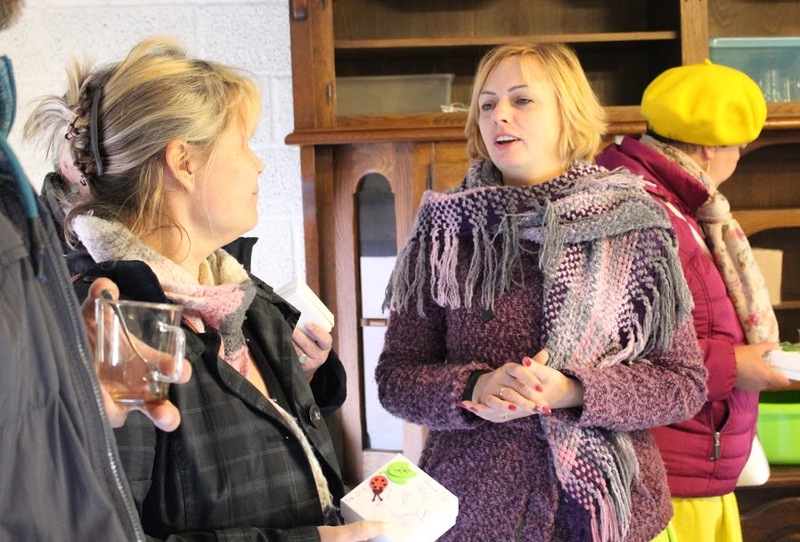 In the beginning of May we had a chance to visit one of the best brewers from our neighbouring country Finland! We visited Takatalo & Tompuri Brewery, ist`s almost a two-hour drive from Helsinki. Mikko Suur-Uski, the host welcomed us. Finland, as we know, is called the land of thousand lakes and islands! Huge finnish rocks – mainland`s glacier`s different surface forms were around us everywhere on our journey. 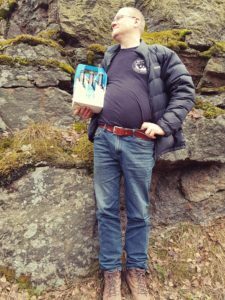 A brewer from Lahemaa Ulvar Veldi climbed to conquer the cliffs of Finland with his beer. 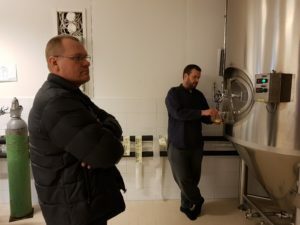 The place where Mikko has the brewery has belonged to his family for 300 years, his father had a dairy farm there earlier, then Mikko with his family started a brewery. Mikko’s background is very interesting, he was one of the best chefs in Finland for years. 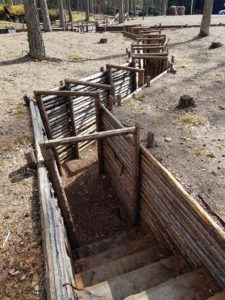 A decision to return to his childhood home (from where he had been so eager to get out, as so many young people do) came suddenly. And so they got all their things, children and dogs together and moved back in order to take over his father’s home. Our friendly host Mikko, his lovely wife, 3 children, 3 dogs and 5 black cats welcomed us there . We went to look at Mikko’s brewery at once. It was huge, Mikko’s brother was also there, he was filling up the beer tanks. Takatalo & Tompuri Brewery is more a family business. Where everybody can offer a helping hand if necessary. 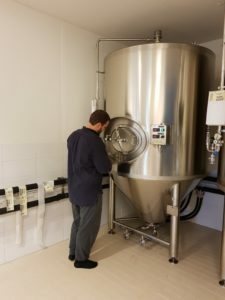 Mikko told us that his teacher, a real beer-guru, had once explained him that – if you learn how to make good pilsner-type beer, you will learn to make beer! Mikko’s style is clean and simple tastes. Our own Estonian beer master Veldi keeps the same style. Actually there are amazingly many similarities between the two beer-makers from different countries. So that made the trip, communication and reception even more pleasurable. Beer-makers talked a lot about types of beer, about making it, about the market situation etc Mikko made us a wonderful lunch (still a chef) and told us about the history of Finland, also how things are nowadays. 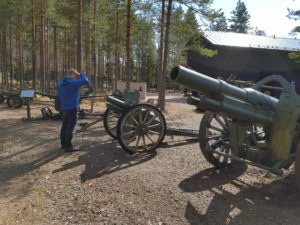 Mikko took us to look at one of the biggest buildings in Finland’s history: the Mannerheim Line. It’s Finland’s honour and pride! 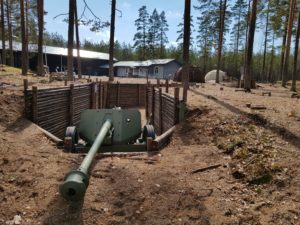 The Mannerheim Line was a defensive fortification line on the Karelian Isthmus built by Finland against the Soviet Union during the Winter War. It is named the Mannerheim Line after Field Marshal Baron Carl Gustaf Emil Mannerheim. It is 135 km long. It looked really powerful, to think how much energy and work it took to build. Walking there and looking at it made me feel proud. Our trip went very well! The reception was warm and lovely. 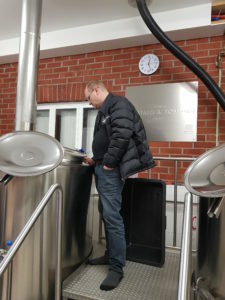 It was very interesting and educating to look at finnish beer-making. To be honest we saw the ohter side of Finland: their history and beautiful towns. And we got to taste the finnish hand-made beer. Now we are negotiating with Takatalo & Tompuri Brewery, would it be possible for us to enter Finnish market with their help. We are grateful to NGO Arenduskoda, the leaders of the project and of course to Mikko Suur-Uski a brewer from Finland for this possibility. Our trip took place on the 2. May 2018.